Umesh V Waghmare, Theoretical Sciences Unit, JNCASR, Bengaluru, elected to Fellowship in 2008, Waghmare works on first-principles theory of smart multi-functional materials, nanomaterials and more recently topological insulators. While obtaining fundamental insights into interesting properties of these materials, his work also has direct relevance to technological applications. Research in his group is aimed at bridging microscopic details of a material to its properties at various length and time scales, and is based on firstprinciples theoretical analysis. 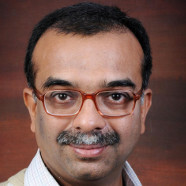 He is a recipient of the Infosys Science Prize (Engineering and Computer Science, 2015), among several others. In a crystal, an electron with a definite energy behaves like a wave that extends spatially through the crystal, and is described by an extended Bloch wave-function. Interestingly, the electronic structure of a crystal exhibits a near-sightedness, which is conceptually underlying the nature of chemical bonding in it. Its precise and local picture is obtained from the construct of Wannier functions, the localized orbitals that form the basis for development of (a) simple models to capture the essential physics, differentiating between metals and insulators, (b) linearly scaling efficient computational methods to determine electronic structure, and (c) a picture of chemical bonding. These ideas apply quite well to dynamical structure of a crystal, as described by the dispersion of its phonons or vibrational waves. The speakers group has shown an interesting relationship between Wannier functions and non-Abelian Berry phases of Bloch electrons, which is centrally relevant to the nontrivial electronic topology exhibited by topological insulators, Weyl and Dirac semimetals.